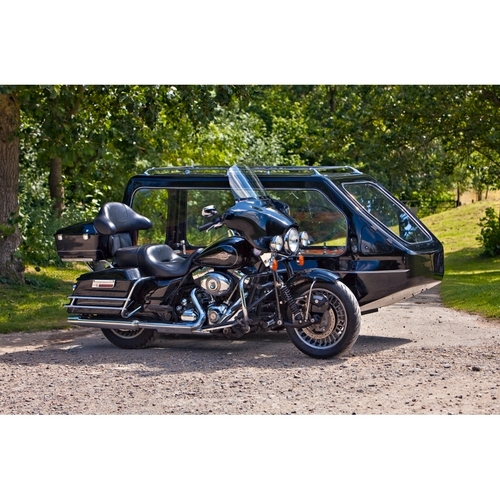 Motorcycle Funerals, UK Wide Motorcycle Hearse Service Complete with a professional rider we hire the UK's first highly agile and professional full length motorcycle and sidecar hearses. The service is UK wide and available in all weather conditions. The company only uses authentic motorcycles. About Us In 2002 Rev. Paul Sinclair founded Motorcycle Funerals Limited, Britain's first ever motorcycle hearse service. Paul, who has served at funerals for 28 years, believes we should reflect people's lifestyles in their funerals. "No one places an Everton fan in a Liverpool strip when they die so why should a motorcycle enthusiast be last seen in an automobile?" 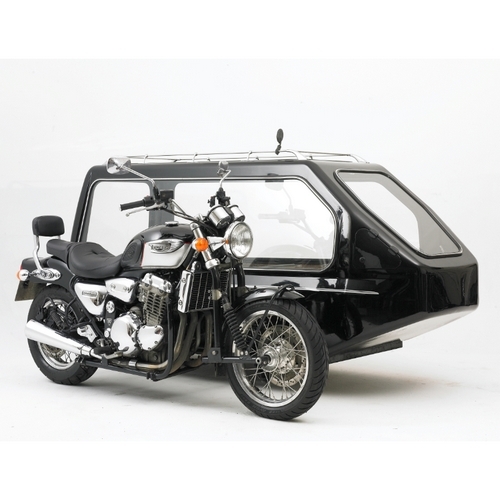 Classic Style Triumph Traditionally styled this 'Proper British Hearse' with it's 'Proper British Bike' was built completely in the UK and is popular with the broadest spectrum of people and motorcycle enthusiasts alike. 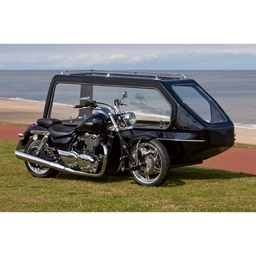 As with all British Specification hearses and the rest of our fleet it has a Funeral Director's pillion seat, flower rail, Health and Safety Hearse fittings, internal temperature control for warm weather and de-misting and a combination of glass roof and internal lights to display both flowers and artifacts. "What a beautiful outfit." "A Proper British Bike." As featured on The One Show on BBC1, Richard Wilson's Two feet in the Grave on BBC1, Robbie Coltrane's B-Road Britain on ITV, Richard O'Brien's Dead Strange on ITV, Inside Out on BBC1, the Doctors BBC1 drama and numerous TV regional news programmes. Suzuki Hayabusa "You did The Ton with my brother; that meant so much." 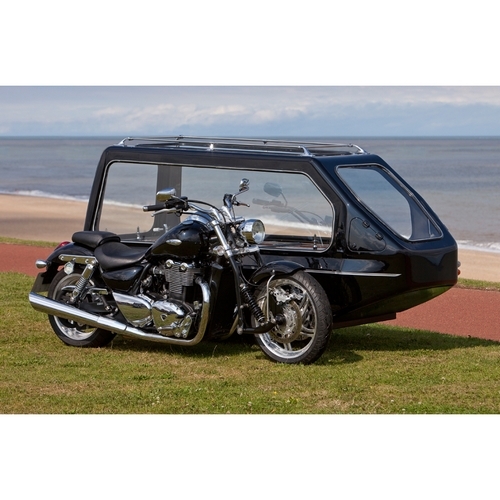 As the fastest motorcycle hearses in the world our Suzuki Hayabusas provide the Ultimate Send Off for the Ultimate Riders. Fast, sleek and popular with racers, marshals, sport enthusiasts and people who lived life in the fast lane. Our Hayabusas have been track tested by Straightliners and Fast Bikes Magazine, featured on Fifth Gear (Channel 5), Robbie Coltrane's B-Road Britain (ITV), Richard and Judy (ITV), Jonathan Ross (BBC1) and numerous regional television news programmes. Harley Davidson This is the Legendary Harley Davidson Electra Glide Hearse as seen on Emmerdale (ITV) for the funeral of Alan Turner. 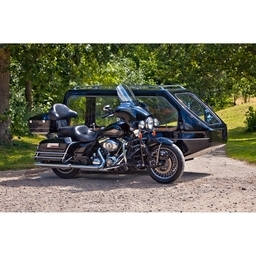 This is the only Harley Davidson where your loved one can remain by your side on that final ride together. 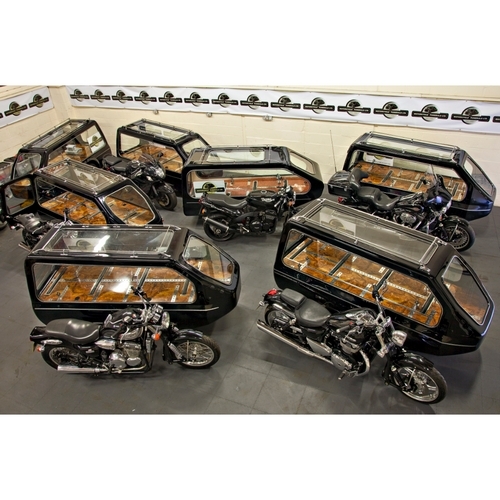 Over the last ten years our Harley Davidson hearses have been featured on ITV's Breakfast TV, Look North on BBC1, Inside Out on BBC1, and numerous TV regional news programmes. Economy When you want an authentic motorbike, but don't mind which one we can often cut down our logistical costs and provide a reduced price. There will be no compromise on quality and we will only send a fully engineered rock-solid motorcycle hearse with a professional rider, nothing less. The saving is gained through reducing our mileage, not our quality of service.